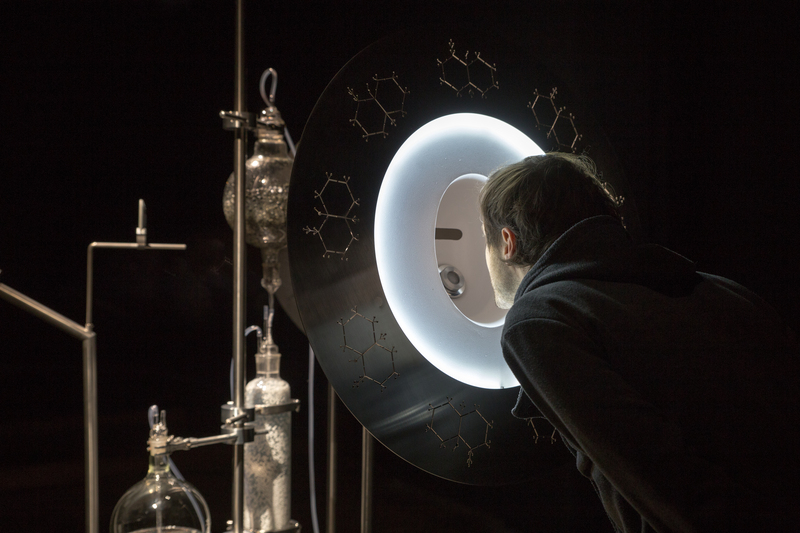 ‘Meta_bolus’ exposes the metabolic process as an exchange of certain boluses or doses that define relationships as either beneficial or adverse. 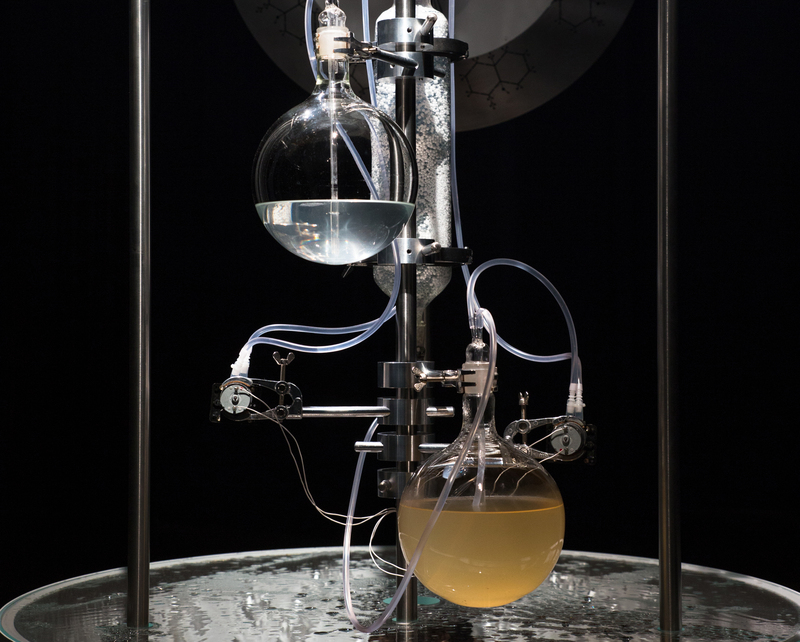 The laboratory structure in the centre of the installation embodies two connected loops of the metabolism of matter in our planet: human extraction of antibiotics from the Streptomyces rimosus bacteria and human consumption of volatile soil elements through the olfactory apparatus. 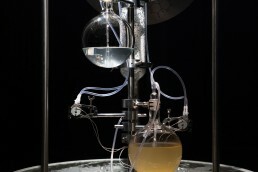 The two looping processes excrete the two metabolites of the Streptomyces rimosus bacteria: the antibiotics and the geosmin aroma. 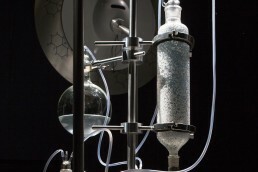 The antibiotics are returned back to the soil through the extraction process that takes place in laboratory glassware. 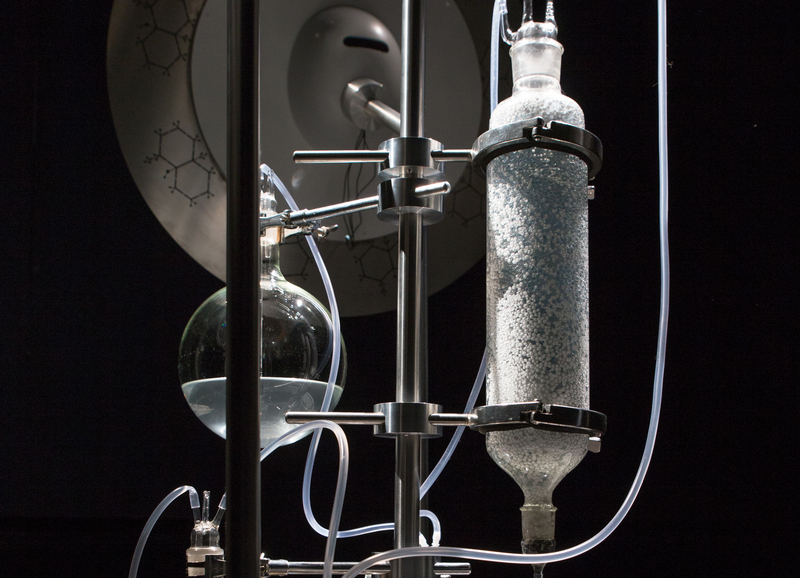 The antibiotic compounds flow as a reminder that soil and dust are a phase in the metabolic process that no agent is able to escape. It also functions as a warning that every metabolic flow has a particular bolus that makes relationship between the agents in the flow beneficial or adverse. The Streptomyces rimosus bacteria shows how important it is to observe and know the bolus, for each bacteria includes the antibiotic as well as the resistance to it and thus the bolus determines whether the dose will be beneficial or adverse. The olfactory metabolic receptors are positioned as a gathering, through which two biological species from different spatial and temporal conditions can perceive and expand their environment. 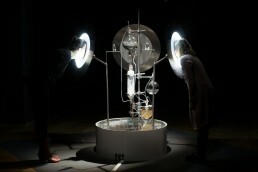 ‘Meta_bolus’ tries to cross the interspecies gap through observation, smell and reflection. Through senses the visitor is lead to consider the geopolitical planetary metabolism. The exhibition was supported by the Ministry of Culture of the Republic of Slovenia and the Department of Culture of the Municipality of Ljubljana. Click on the button below to subscribe to our monthly newsletter and know more about events at Kersnikova.